Microsoft has improved and brought many new features and functionality to Windows Console, the console hosts that supports all character-mode applications, such as the Command Prompt and the Windows PowerShell prompt. Resize the console window by grabbing an edge with the mouse and dragging it. Support semi-transparent with a minimum transparency of 30%. New options for selecting text and lines, marking text, editing text and using the buffer history. 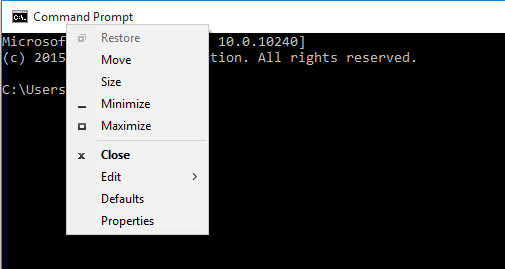 The new functionality for Command Prompt and Windows PowerShell is enabled by default when you install or upgrade to Windows 10. If you want to use just a legacy console for Command Prompt and/or PowerShell, or if your Command Prompt and/or PowerShell do not seem to have new features enabled, the following guide shows you how to access the setting to enable the new features in Command Prompt or PowerShell console, or disable the new features to use only legacy console. Open Command Prompt or Windows PowerShell console (e.g. via Power Users menu). Right click on the top title bar (or click on the logo on the left of the title bar) to open the contextual menu. To enable new console features – Uncheck the Use legacy console option. 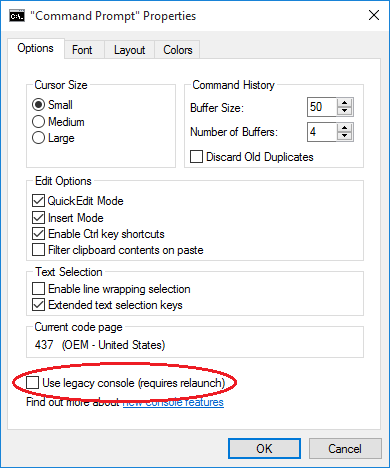 To disable new console features – Check the Use legacy console option. ForceV2 1 enables all new console features; 0 disables all new features. LineSelection 1 enables line selection; 0 to use block mode only. FilterOnPaste 1 enables new paste behavior. LineWrap 1 wraps text when you resize console windows. CtrlKeyShortcutsDisabled 0 enables new key shortcuts; 1 disables them. ExtendedEdit Keys 1 enables the full set of keyboard selection keys; 0 disables them. TrimLeadingZeros 1 trims leading zeroes in selections made by double-clicking; 0 keeps the leading zeros. WordDelimiters Defines the character that is used to skip to when selecting text a whole word at a time with CTRL+SHIFT+ARROW (the default is the space character). Set this REG_SZ value to contain all characters you want to be treated as delimiters.